Pet cremation is big business for human funeral homes looking to branch out into other industries. And normally I wouldn’t just trot out a press release for a Death Reference Desk post but this newly announce initiative about human and pet cremation groups coming together to produce guidelines really intrigued me. Chicago, IL – The Cremation Association of North America (CANA), an international organization composed of cremationists, funeral directors, cemeterians, industry suppliers and consultants, and the International Association of Pet Cemeteries and Crematories, an international organization recognized as the authority in the pet aftercare industry, have been working together to develop industry guidelines for pet cremation practices. So there you have it. Pet Cremations and Human Cremations will finally find common ground. And new terms will be invented too. That’s even better. 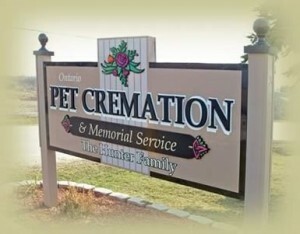 Actually, I totally support pet cremation and I think that people should handle the death of a pet as they see fit. The death of a pet can be more heart braking than the death of a human relative. My only concern is that these new agreed upon standards don’t create higher prices. That seems to happen too. Posted by John in Cemeteries, cremation, Funeral Industry and tagged animals, cremains. Bookmark the permalink.